Please note: If you selected your domain name when you first created your website, your site will already be published. Any time you want to apply your latest changes to your published site, simply click Publish. Search for a custom domain (you can also take a look at: Buying your own domain from Yola). 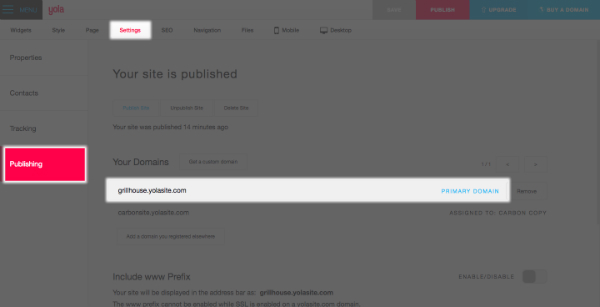 Try a free Yola subdomain. Already own a domain (only available to Yola Bronze, Yola Silver, Yola Gold and partner program subscribers). For now, we are going to use option two (Try a free Yola subdomain) but the others are available for you to use should you prefer. If you have not purchased your own domain name, or you don't want to do so right now, then option two is the one for you! The text box will be automatically populated based on the name you have given your site. You can opt to keep this as your domain name or decide on a different name. Once you've typed in the domain name, you will get a message stating whether the name you have chosen is available. If you are told that the domain is unavailable, this means that the domain has already been registered and you need to select a different name. If you see the message "Invalid Domain! ", this means that you have used a character that is not permitted and you need to make the necessary adjustment. Valid domain names can only contain alphanumeric characters and no spaces. 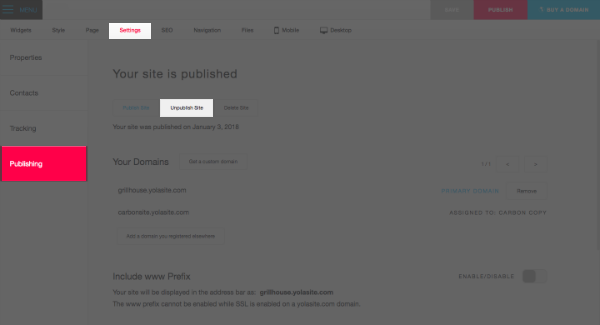 Once you have selected a subdomain name that is available, click Next to publish your site. You will now see a message saying "Congratulations. Your site has been published to the web." You can access your site any time by clicking on the link, or by typing your website address into the address bar of your browser. If you ever need to check what your web address is, you can go to Settings > Publishing. 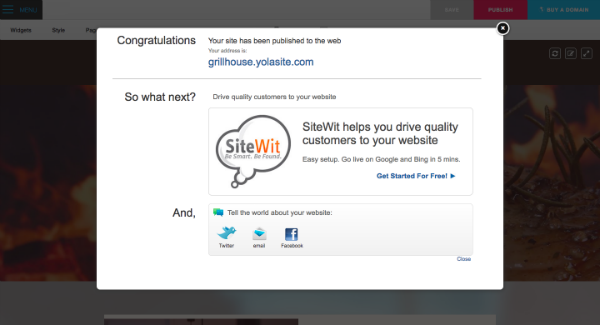 The web address will be displayed in the "Your site is published" and in the "Your Domains" section. Please note: Your site is live on the internet and people can visit it as soon as it is published. However, to begin with, you will not be able to search for your site by typing the address into a search box (such as Yahoo! or Google). This is because it takes time for newly-published sites to be indexed so that they become searchable. If you are interested in reading more about getting your site found on search engines, take a look at our Promotion, SEO, Traffic and Advertising tutorials for information about how to get started with SEO. Once you've made changes in the Sitebuilder and are ready for them to be applied to your published site, click the Publish button. 1. 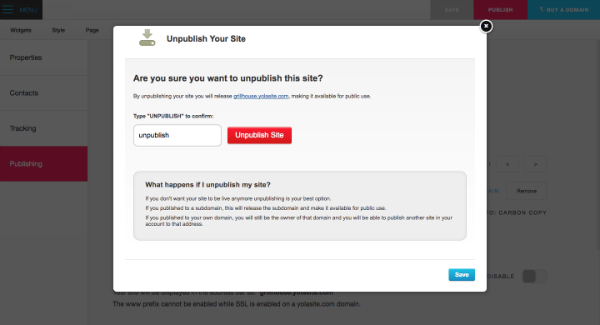 Go to Settings > Publishing and click Unpublish Site. 2. A dialog box will open up asking to confirm if you want to unpublish. 3. Type "Unpublish" into the text box provided and click Unpublish Site. 4. Your site is now unpublished. You can always publish again at a later stage if you wish.